When was the last time anyone in Congress passed a truly good idea? I can’t remember. But they do manage to come up with bad ideas, and sometimes these ideas make their way into laws, causing no end of harm. This month, two U.S. Congressmen have come up with the idea to offer prizes rather than grants for scientific research. They were inspired, according to a story in Science magazine, by DARPA’s prize competitions for robotic vehicle design, as well as the private XPRIZE competition. Now Congress wants the National Institutes of Health to give out prizes for biomedical research. They've tucked this idea into the 21st Century Cures Act, a bill funding the NIH and FDA that was passed by the House of Representatives on July 10. Congressman Todd Young of Indiana and Andy Harris of Maryland amended the bill to require NIH to create a new prize competition. This is a staggeringly bad idea. Why? Where do I begin? Well, first of all, biomedical research costs money–lots of money. Everyone I know in biomedical research, in which I’ve been working for 25 years, needs money before they make their discoveries. A prize at the end is nice, but you can't do anything if you can't pay for equipment, supplies, and (perhaps Congress will be surprised to learn this) people’s salaries. Flawed though it may be, the current U.S. funding system works pretty well: scientists write up their ideas as proposals, NIH or NSF convenes panels of experts to review those proposals, and the best ones (more or less) get funded. A prize, on the other hand, is awarded after the work gets done. If this is how we’re going to fund science, then very little good work will get done. Only rich people, or rich companies, will be able to compete for prizes in biomedical research. That's how science worked in the 1800s and before, when the only way to do science was to find a wealthy patron, or to be wealthy yourself. Not surprisingly, things moved slowly back then. This just gets worse and worse. There’s no way that 9 people, even if they’re all great scientists, can choose the best idea from among all areas of biomedical research. This is why NIH convenes hundreds of scientific review panels every year to do peer review: they need experts who understand the specifics of the research. These 9 people will be responsible for giving away $80 million per year in prizes. In the scientific world, that's a huge program. 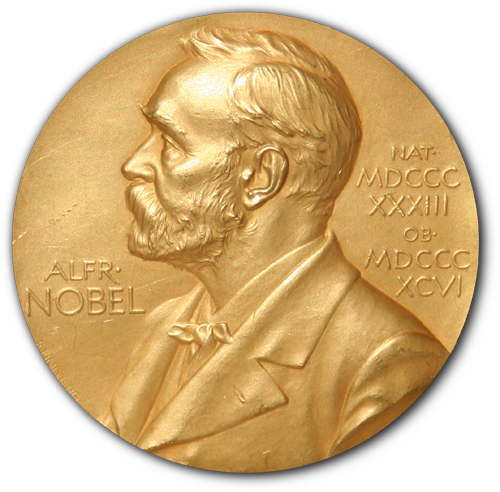 Look at it this way: the Nobel committee gives out five prizes of $3 million each, or $15 million per year. If this passes the Senate, Congress will have created a prize that is 5 times larger than the Nobels, to be handed out by a yet-to-be-named committee of 9. But this committee is fraught with problems: 5 out of 9 members will be political appointees, with no requirements that any of them have any scientific or medical training. And because the Director of NIH is a political appointee, one could argue that all 9 are political appointees. What's more, the appointments will last for 5 years, making them truly powerful committee members who will be unaccountable to the public or to anyone else. One thing is certain: the prize committee members will be flooded with lobbying efforts to sway their choices. This sounds a lot like how Congress works; or rather, how the ugly underbelly of Congress operates. In other words, NIH will give these prizes to foreign citizens–and companies! So apparently they will take some portion of NIH's budget, and instead of awarding it in grants to U.S. scientists, they will give prizes to companies in, say, Russia. Don’t get me wrong: I think science should be supported in every country around the world. But each country has its own system, and the NIH is by far the most important source of funding for biomedical science in the U.S. We just can't afford to have NIH give out prizes to the entire world. Competition for grants is already fierce, with fewer than 20% of scientific proposals being funded today. Did I mention that this prize competition is a terrible idea? Here's another little gem: the bill allows the NIH Director to outsource the administration of the prize competition to a private company, who can take 15% of the money for itself. Was a private contractor involved in writing this bill? I’m guessing some company is already making plans to siphon off precious research funds running these competitions–and I wouldn't be surprised if they had a hand in drafting the bill. The 21st Century Cures Act has some great things in it, such as an extra $1.75 billion per year for NIH over the next 5 years. Many people, scientists and non-scientists alike, would like to see that happen. But Section 1002, Prize Competitions needs to be deleted when the Senate takes this up. We could certainly do a better job allocating scarce funds to biomedical research in the U.S., but setting aside a large sum to be awarded by a politically-appointed Prize Committee at NIH is a staggeringly bad idea. Let’s stop this train before it leaves the station. Would you pay the same tuition for a Harvard degree as for a second-rate school that you've never heard of? Probably not. But thanks to the federal government’s help, that’s exactly what we are all doing. 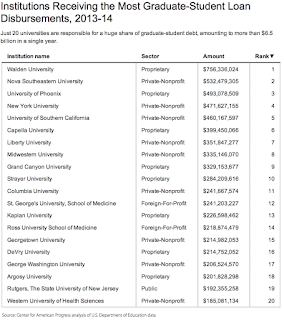 It turns out that many of the biggest beneficiaries of federal loan programs for graduate schools are low quality, for-profit universities that have figured out how to turn federal largesse into nice fat profits. A new study from the Center for American Progress finds that just 20 universities account for nearly one-fifth of all grad student debt, a total $6.6 billion. What’s perhaps most surprising is who those universities are: 10 of the 20 are for-profit schools, including two foreign schools. 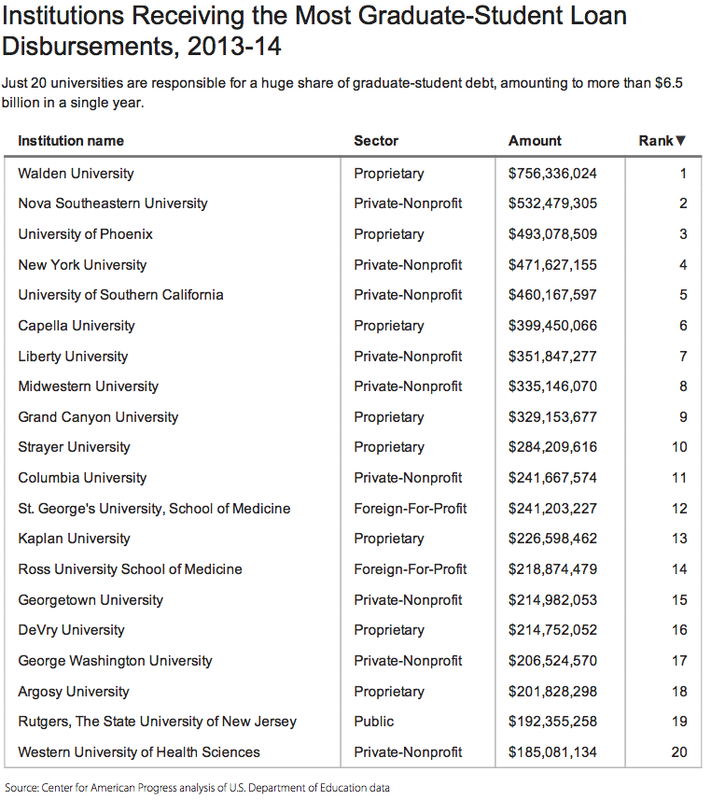 The problem here is that these schools offer terrible value for the money. There’s little debate (except from the schools themselves) that these schools have very low standards for admission. The only requirement seems to be money, and if you don’t have it, they will help you borrow it (often from the federal government). The degrees themselves are barely worth the paper they are printed on, because the reputations of most of these schools are–well, let's just say they aren't good. Graduate degrees do improve your career choices, if you get them from a well-regarded institution. But when the school isn’t even ranked in the top 200, a degree isn’t going to open any doors, and it’s certainly not worth borrowing tens of thousands of dollars to get one. For-profit schools are taking advantage of a quirk in the law governing student loads. As Elizabeth Baylor at the Center for American Progress explains, the Higher Education Act allows graduate students to borrow much more than undergrads, up to $50,000 per year. Online, for-profit universities encourage students to borrow far more money by offering graduate degrees (what they call graduate degrees, anyway) rather than bachelor's degrees. I first wrote about these for-profits nearly five years ago (see “The Yugos of Higher Education”), and everything I wrote then is still true. For-profit schools continue to award “worthless degrees that leave students with a mountain of debt,” as reported on the show Frontline. I've heard the argument from the other side: we’re offering education to people who aren’t served by mainstream universities, they say. Well, maybe that used to be true, but no more. Are you a student who just wants to learn a new skill? Today you can get high-quality education for free through Coursera or EdX, which offer courses taught by professors at the country's top universities, including my own. If you want a certificate of completion for a course, you can get it for as little as $50 at Coursera. If, on the other other hand, you want a degree to burnish your resume, there are thousands of small (non-profit!) colleges in cities around the country that offer equal or better training, at lower cost, than for-profit universities. Let me try another comparison. Let’s supposed you wanted to borrow $20,000 to buy a new Mercedes. That seems reasonable, since the car itself is collateral for the loan. Now suppose instead you wanted to borrow the same $20,000, but you’re going to use it to buy an old Yugo, one of the worst cars every made. Why should anyone lend you the money for that? Yet that’s exactly what we’re doing by subsidizing loans for mediocre universities. Could it get any worse? Well yes, actually: the 7th-largest recipient of graduate student debt, at $352 million, is Liberty University, a school founded by the fundamentalist Christian televangelist Jerry Falwell. This school doesn’t just offer a mediocre education. Instead, they mis-educate by teaching students creationism instead of evolution. They even have a Center for Creation Science to “promote and communicate a robust young-Earth creationist view of Earth history.” This is misinformation masquerading as education. It’s too bad that for-profit universities continue to draw in students with promises of a better future, only to leave them in debt. But we don’t have to subsidize their practices. Let’s stop offering loans for degrees at online-only and for-profit schools.